Enjoy the convenience of having the tickets delivered to your doorstep, free of charge! Read Klook's travel guide to Rome and find out some of the best attractions to visit like the Colosseum! Miscalculated the fare and ended up buying the 5days pass for Italy as we will pay lesser (quite significantly) if we prepurchase the ticket well before time. However, the pass gave us the flexibility to have any change of plans as we are able to book the train the day before we depart or just right before where train tickets prices would have gone up. Making reservation for the train was easy using the self service ticket machine, BUT do note that we need to pay EUR10 for seat reservation and we paid additional EUR90 each on top of the pass. NOTE: I bought the tickets when they are having promo, at $450 for 2. I’ve calculated per trip cost about 25EUR including the reservation fees. Make your journey to Italy as easy and hassle-free as possible with the Eurail Pass for Italy, which offers unlimited train rides in the country for up to 8 days! Make a booking by selecting your date of departure to Italy, along with your preferred train cllass & validity period, and you're all set. When you get to Italy, just activate your pass at a train station and enjoy the convenience of not having to purchase multiple tickets throughout the trip. 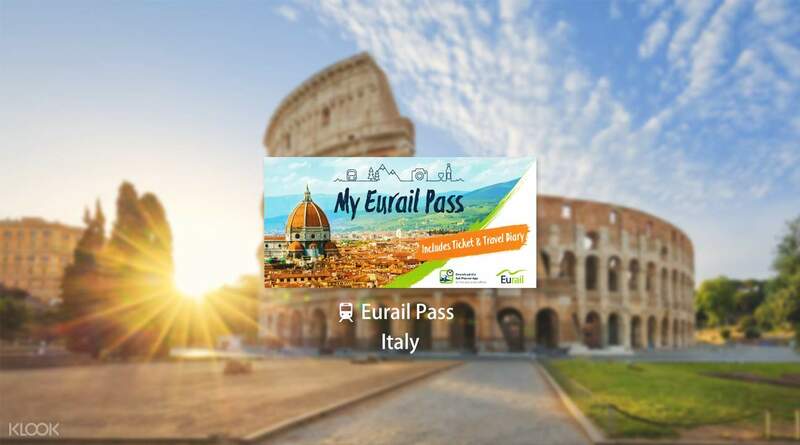 Your Eurail Pass for Italy will also be delivered directly to your doorstep free of charge and comes with cool benefits like discounts on other means of transportation, city cards, and more. Save up to 10% when you book your Eurail pass from now until 8 April 2019! You must show your physical pass and passport or proof of residence when the conductor comes around to check your ticket on the train. Never leave them at home! Just take note that Frecce trains need to have a reservation, which cost an additional €10. While the regional trains doesn’t need prior reservations. Generally it was convenient to use. Just remember to have it activated when you arrive and make sure you write on your diary that comes along with your Eurail. Just take note that Frecce trains need to have a reservation, which cost an additional €10. While the regional trains doesn’t need prior reservations. Generally it was convenient to use. Just remember to have it activated when you arrive and make sure you write on your diary that comes along with your Eurail. So convenient to use! Just validated the pass at Milano Centrale Ticketing Office and I’m off exploring Italy by train. Be sure to fill in the dates of travel and destinations to ease the checking by the officers. Just pay extra for reservation seats for express trains. Used the ‘Rail Planner’ app to plan our train rides. Beware trains may delay so make sure there’s enough time for transit. So convenient to use! Just validated the pass at Milano Centrale Ticketing Office and I’m off exploring Italy by train. Be sure to fill in the dates of travel and destinations to ease the checking by the officers. Just pay extra for reservation seats for express trains. Used the ‘Rail Planner’ app to plan our train rides. Beware trains may delay so make sure there’s enough time for transit. The Eurail can only be used for Trenitalia train from city to city. It can't be used for the Metro Lines and for the express train to the airport. But the first class is very worth it as its spacious and there is free Wi-Fi and snacks and beverages on board. The Eurail can only be used for Trenitalia train from city to city. It can't be used for the Metro Lines and for the express train to the airport. But the first class is very worth it as its spacious and there is free Wi-Fi and snacks and beverages on board. Miscalculated the fare and ended up buying the 5days pass for Italy as we will pay lesser (quite significantly) if we prepurchase the ticket well before time. However, the pass gave us the flexibility to have any change of plans as we are able to book the train the day before we depart or just right before where train tickets prices would have gone up. Making reservation for the train was easy using the self service ticket machine, BUT do note that we need to pay EUR10 for seat reservation and we paid additional EUR90 each on top of the pass. NOTE: I bought the tickets when they are having promo, at $450 for 2. I’ve calculated per trip cost about 25EUR including the reservation fees. Miscalculated the fare and ended up buying the 5days pass for Italy as we will pay lesser (quite significantly) if we prepurchase the ticket well before time. However, the pass gave us the flexibility to have any change of plans as we are able to book the train the day before we depart or just right before where train tickets prices would have gone up. Making reservation for the train was easy using the self service ticket machine, BUT do note that we need to pay EUR10 for seat reservation and we paid additional EUR90 each on top of the pass. NOTE: I bought the tickets when they are having promo, at $450 for 2. I’ve calculated per trip cost about 25EUR including the reservation fees. Nice trip and ticket for Italy. Nice trip and ticket for Italy. is totaly not recommended for the pass. esplanade trenitalia company. this italy eurail pass only can be used in train but not metro, subway, bus. the pass only can sit for company trenitalia but not other train company. I actually bought 2nd class pass for 8 days. Everytime when u consider what time should depart for ur plan of the day accordingly to the train schedule, mostly only the high speed train available. And the most important part was, all high speed train need to pay 10euro per person for a reservation seat. It doesn't matter u want to reserve or not, u still have to pay for 10euro. The high speed train worst part, it do not even have a place to put the big baggage. so i bought such expensive rail pass but only can seat for local train for example from milano to verona with high speed train takes 1.30 hours, if local train will be like 2-3 hours. And we not really know this pass is a flexi pass, they requested to write on the date of the day when u board on train. Because of the italian english is limited edition, no one of the trenitalia crew inform us about this issue, so we got fine 25euro per person in one of the local train. i totally not recommended trenitalia, it was the poor company ever i took, i am so regret with this ticket. I sincerely hope that Klook can withdraw of selling this italy eurail pass to avoid disappointed other Klook customer. SAY NO and NEVER to Trenitalia !!!!!!!!!!!!!!!!!!!!!!!!!! Remember my friends, for those who are considering this Italy eurail pass, NEVER !!!!!!! is totaly not recommended for the pass. esplanade trenitalia company. this italy eurail pass only can be used in train but not metro, subway, bus. the pass only can sit for company trenitalia but not other train company. I actually bought 2nd class pass for 8 days. Everytime when u consider what time should depart for ur plan of the day accordingly to the train schedule, mostly only the high speed train available. And the most important part was, all high speed train need to pay 10euro per person for a reservation seat. It doesn't matter u want to reserve or not, u still have to pay for 10euro. The high speed train worst part, it do not even have a place to put the big baggage. so i bought such expensive rail pass but only can seat for local train for example from milano to verona with high speed train takes 1.30 hours, if local train will be like 2-3 hours. And we not really know this pass is a flexi pass, they requested to write on the date of the day when u board on train. Because of the italian english is limited edition, no one of the trenitalia crew inform us about this issue, so we got fine 25euro per person in one of the local train. i totally not recommended trenitalia, it was the poor company ever i took, i am so regret with this ticket. I sincerely hope that Klook can withdraw of selling this italy eurail pass to avoid disappointed other Klook customer. SAY NO and NEVER to Trenitalia !!!!!!!!!!!!!!!!!!!!!!!!!! Remember my friends, for those who are considering this Italy eurail pass, NEVER !!!!!!! It is not recommended at all that there is no research to buy left, so regret that sitting on many express trains is more than 10 euro reserve seat! 完全不推薦 當初無做research 買左，好後悔 坐好多快車都要比多10歐reserve seat!